The dusty subterranean corridors of GURPS Dungeon Fantasy have proven endlessly rewarding for those who've explored them. Yet still delvers desire more powers and options . . . while GMs have longed for more traps and obstacles. 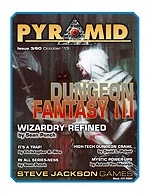 We have heard those plaintive echoes and returned with unimaginable treasure: Pyramid #3/60: Dungeon Fantasy III. This issue includes two articles by Dungeon Fantasy architect Sean Punch; the first rips open the possibilities of bardic and wizardly spell-list options, while the second is a designer's overview of the series -- including the new beastmaster template (for those with animal magnetism). Whether you're looking to add danger to your dungeons, possibilities to your professions, or spells to your sorcerers, Dungeon Fantasy III is a treasure trove of topics. Pick up this issue individually, or start your subscription today and crack open an undiscovered vault of gaming goodness . . . with Pyramid!